‘Potluck’ is a meal or party to which each of the guests contributes a dish. We went to IMM (International Merchandise Mart) Mall in Jurong East to see this new factory outlets mall then we wanted to find a restaurant to have lunch. In the spirit of trying a different dining concept, we chose to have our lunch in “Pot Luck” restaurant. Don’t worry…you don’t have to contribute any dish when you come to this restaurant. It’s just their name. They offer you unlimited rice and drinks and expect you to share the meals with your group. The concept of potluck can be understood that the guests in a table are expected to share their meal with one another. As I came with my husband and our two children, we had to pay for 4 rice and 4 drinks. Then each of us can take the rice and drinks as much as we want. As for the drinks, they offer hot drinks: black coffee, cappuccino, latte, mocha, teh tarik, white coffee and cold drinks: Pepsi, Pepsi light, Mirinda orange, root beer, Mountain Dew and ice lemon tea. Excellent choice, isn’t it? This arrangement is very suitable for my son, Maxi who likes to eat rice and drink a lot. 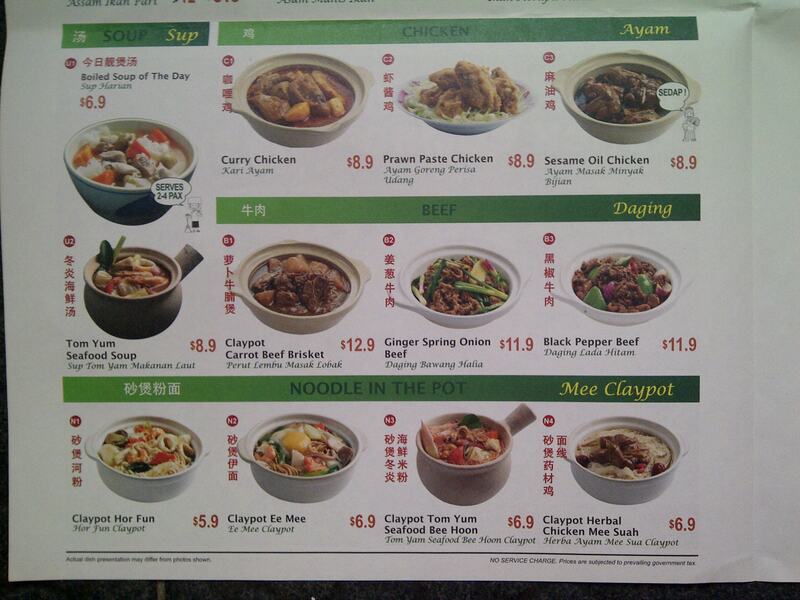 Now about the food….. Their specialty is claypot meals. Cooking meal in a claypot will help enhance the flavour and keep the food warm for longer time. 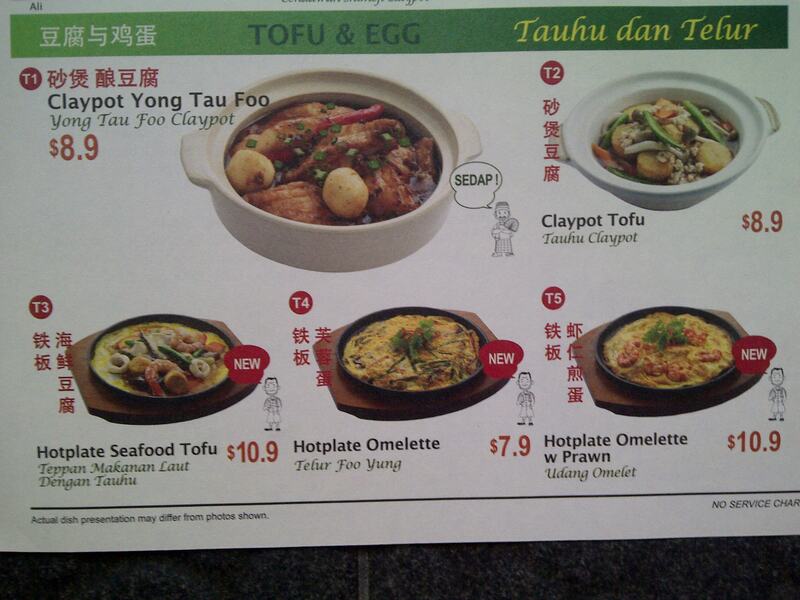 They have fish, chicken, beef, seafood, vegetable, tofu and egg menu. 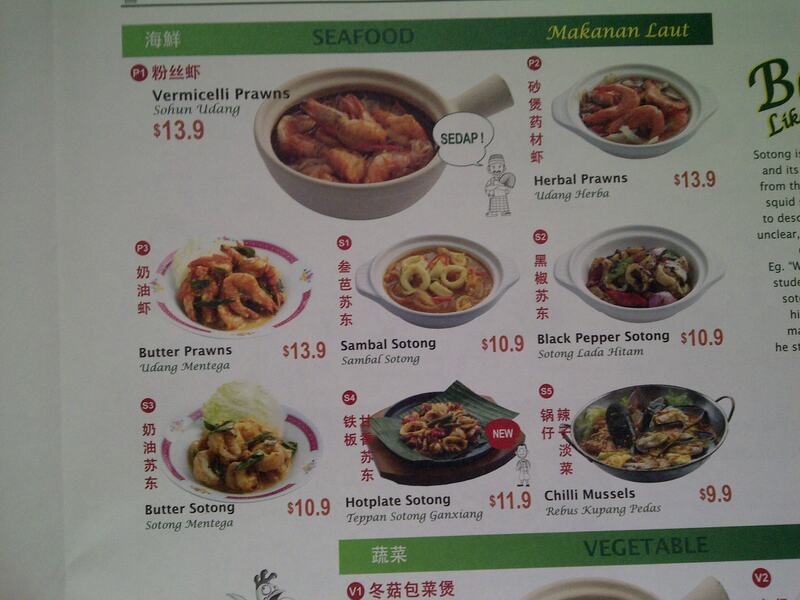 Moreover, they also have some popular side dishes such as fried chicken wings (Maxi’s favourite), sotong balls, fish ball, chicken popcorn (Devani’s favourite) and so on. 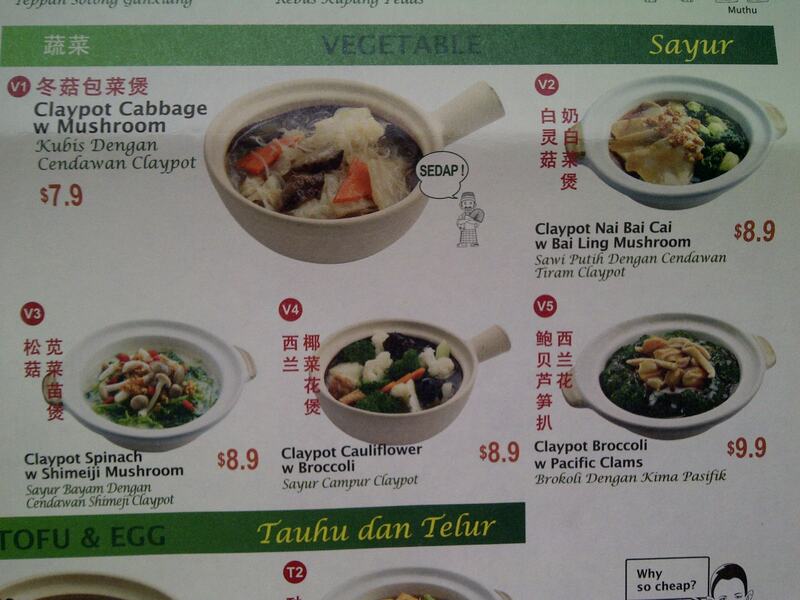 In my opinion, the side dishes are very suitable for kids and teens who may not like the claypot meals. As you can see in more details from the photos, the prices are very affordable. The portion is quite big because they expect you to share the meals with your family/friends. The prices for the free flow drinks are SGD 2.8 (for adults) and SGD 1.8 (for kids between 4 to 12 years old). 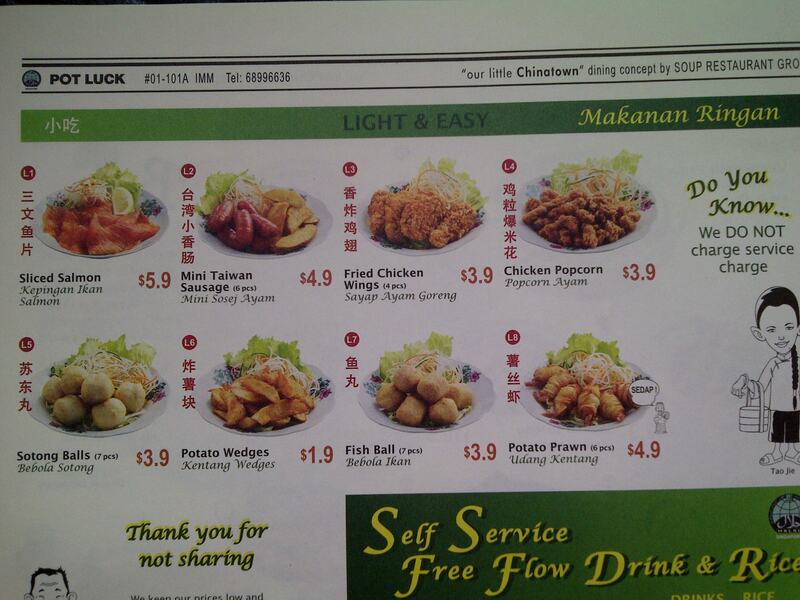 Rice for adults is SGS 1.5 while for kids is SGD 1. Kids under 3 years old can drinks and eat rice for free. As the prices are very reasonable, they expect each customer to pay for one rice and one drink. Sharing rice and drink is not allowed. 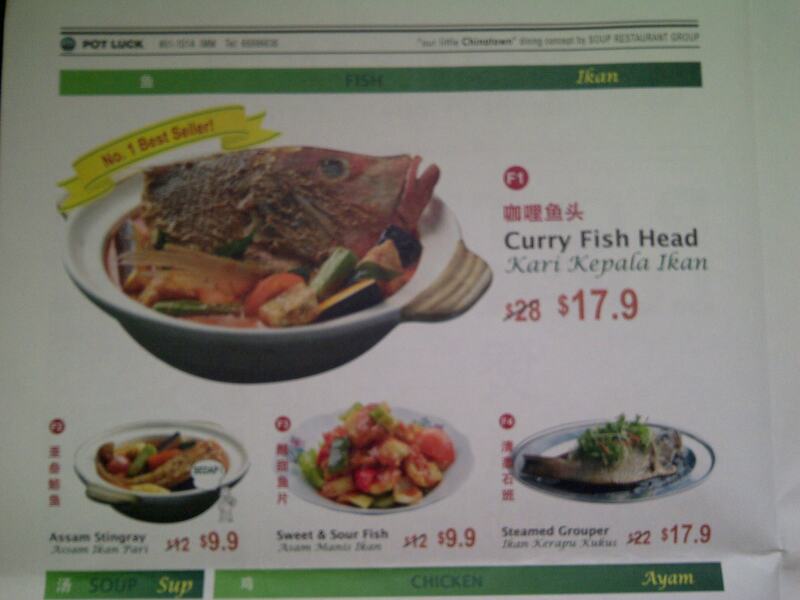 I think this policy is very understandable considering the prices they offer. What we ordered? Claypot Ee Mee for me; Claypot Tom Yum for my husband; Chicken Wings for Maxi; Chicken Popcorn for Devani. The restaurant is not big and quite crowded at lunchtime. As the name suggested, guests come in group as they want to share the meals. Overall, we are happy with this restaurant…the food, the service and the price! I like to visit a theme park such as “Disneyland” and “Universal Studios” mostly to see the parade and shows (I’m not that brave to ride on the challenging rides!). When I went to the “Universal Studios Singapore” (USS) recently with my family, we intentionally chose to go there on Sunday because the parade is only scheduled on the weekends (Saturday and Sunday). As per the schedule, the parade will start on 3 PM from “WaterWorld” and end in “New York” area. We were already tired after lunchtime so we quickly tried to find a good spot to sit and take a rest while waiting for the parade to start. USS was crowded that day; it’s Sunday and it’s the holiday season so it was a good decision to find our spot early. Finally, my children and I sat near the “New York” area while my husband was near the “Transformer” ride (because he wanted to ride the Transformer while the crowds were busy watching the parade). The parade is called “Hollywood Dreams Parade”. The parade is divided into six segments which are the Opening, Madagascar, Shrek, Jurassic Park, Revenge of the Mummy and the Closing. Let’s enjoy the “Hollywood Dreams Parade”! The Opening was started by the Sesame Street Characters who walked in the front of the first parade car. The second segment was my favourite…here comes the Madagascar! I remember Devani and Maxi used to like the movie so much. Shrek and his friends were in the next sequence. I was a little bit disappointed because “Puss in Boots” was not included in the parade. After meeting the Shrek, we were invited to come to the Jurassic Park. This was also Maxi’s childhood favourite. He used to watch the movie everyday! In my opinion, the dinosaurs in the USS are well-made. The colours, the size, the movement, the sound are all nicely presented. I’m not a fans of the “Mummy” but yeah…here they come! The Cleopatra was actually not that bad! She acted well! To be frank, I think the parade was too short (compared to the waiting time we had prior to it). The parade was ended with another Hollywood scene…Marilyn Monroe, champagne, cabaret dancers. Right after the parade ended, it started to rain! Many people including us quickly walked to the nearest restaurant so we can avoid the rain and grab some snacks! If you think that visiting gardens is only suitable for the senior citizens and young children, you are wrong. 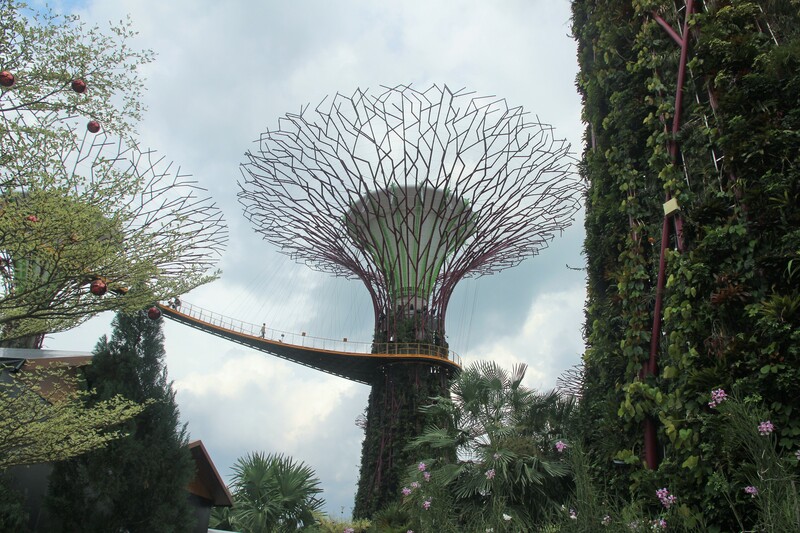 Our teens, Devani and Maxi enjoyed their visit to Gardens by The Bay in Marina area, Singapore. 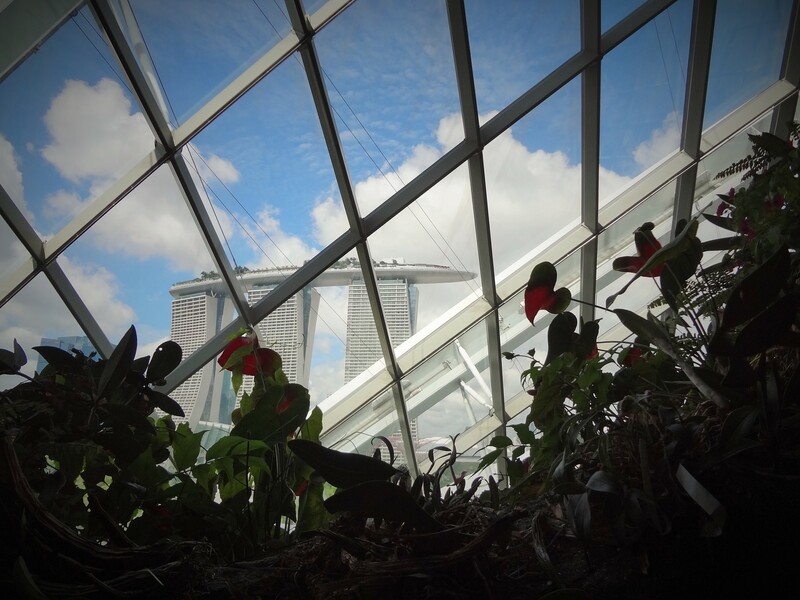 We went to the Gardens by MRT Downtown Line, alight at Bayfront MRT Station. We took Exit B and followed the sign to the Gardens. Along the way, we passed Malay Garden, Chinese Garden and Indian Garden before we arrived at the Ticketing Centre. I regret that I didn’t buy the tickets in advance via online or travel agent in Jakarta. 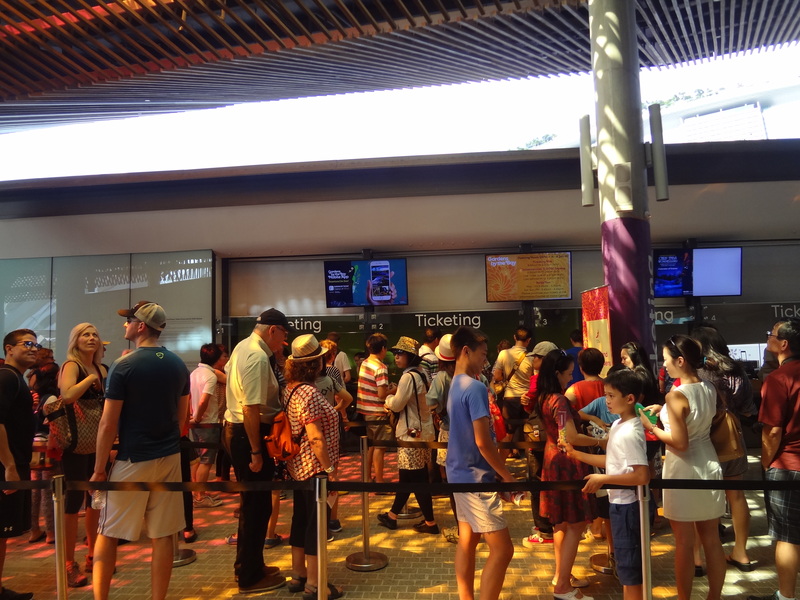 My husband had to queue for the tickets quite long because we visited the gardens on the peak season. The cost of a standard ticket for adult is SGD 28 per person. 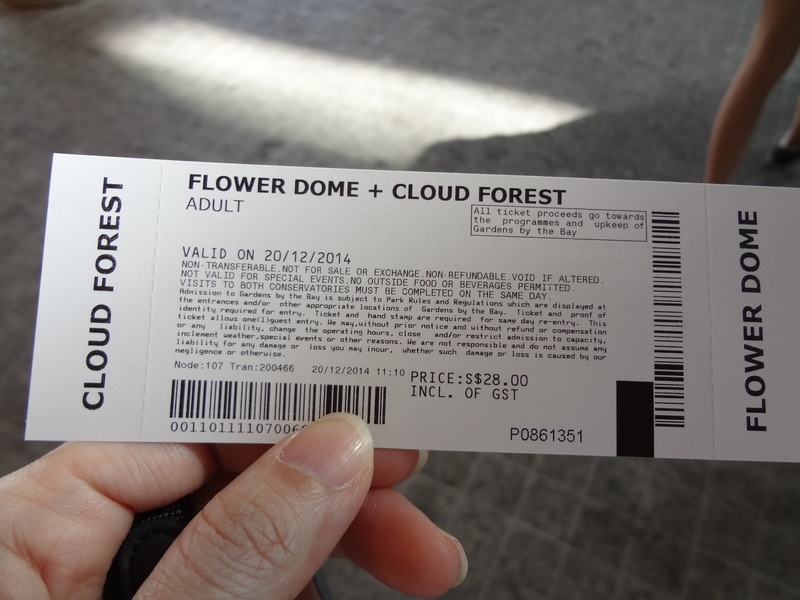 This ticket can be used to visit the two main domes which are the “Cloud Forest” and “Flower Dome”. The Gardens were in full Christmas decorations when we visited. Red and white were the main colours of the decoration. They put fake snow in some areas to make the display more dramatic. 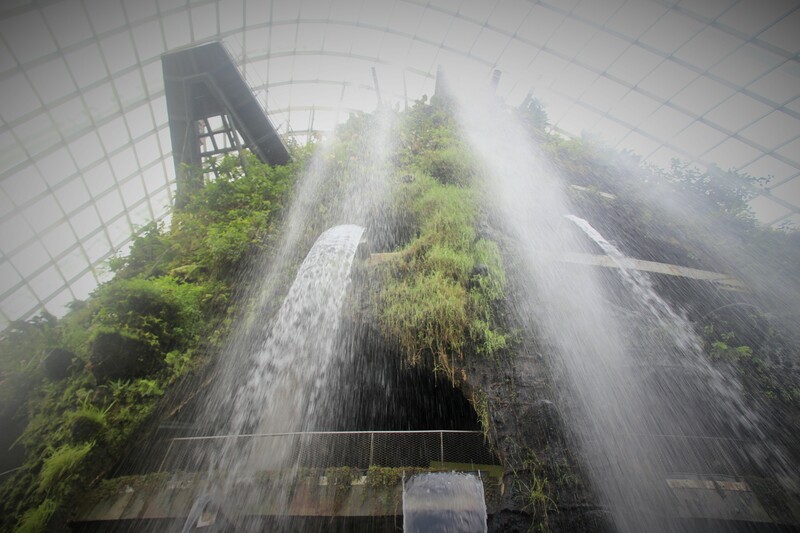 We started with the Cloud Forest as recommended by Maxi. The first impression was so grand! 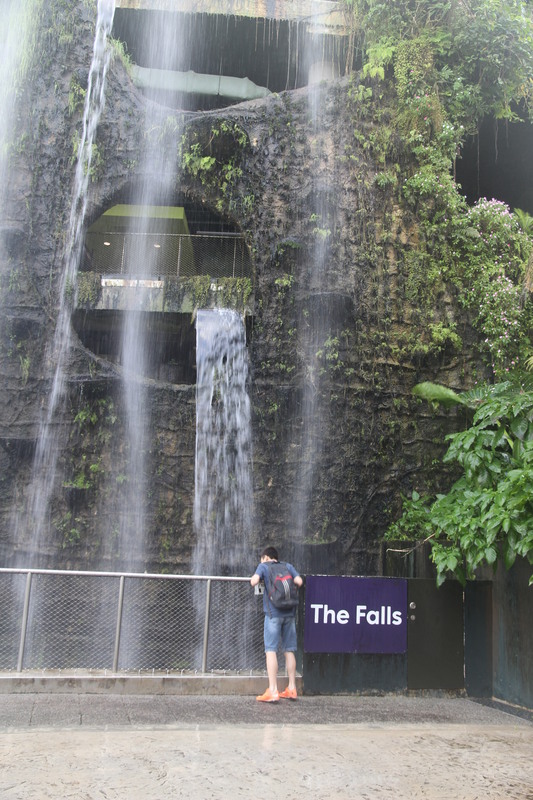 We were welcomed by “The Falls” which is a 35-metre (man-made) waterfall. We could really feel the fresh air in the this area that made us wanting to stay for a while…to take photos and deep breaths. 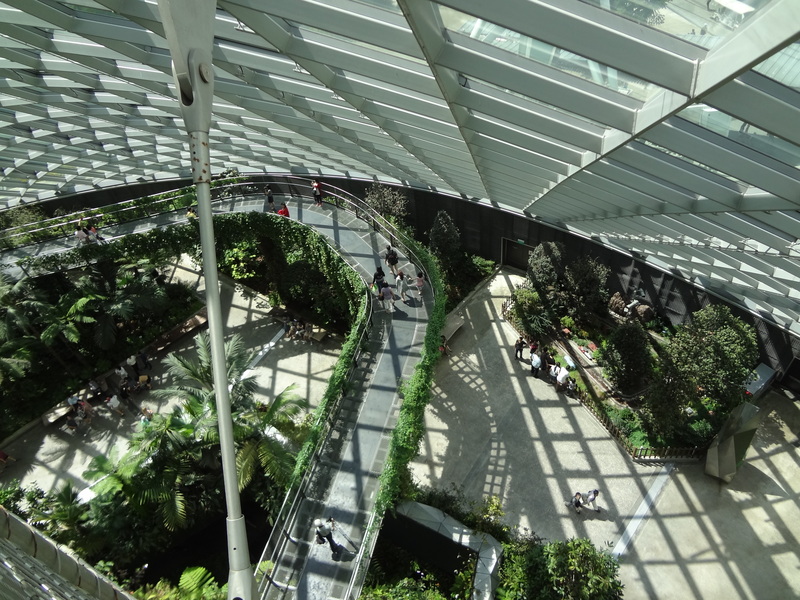 The temperature of the whole dome is kept to be cool to maintain the freshness of the plants. 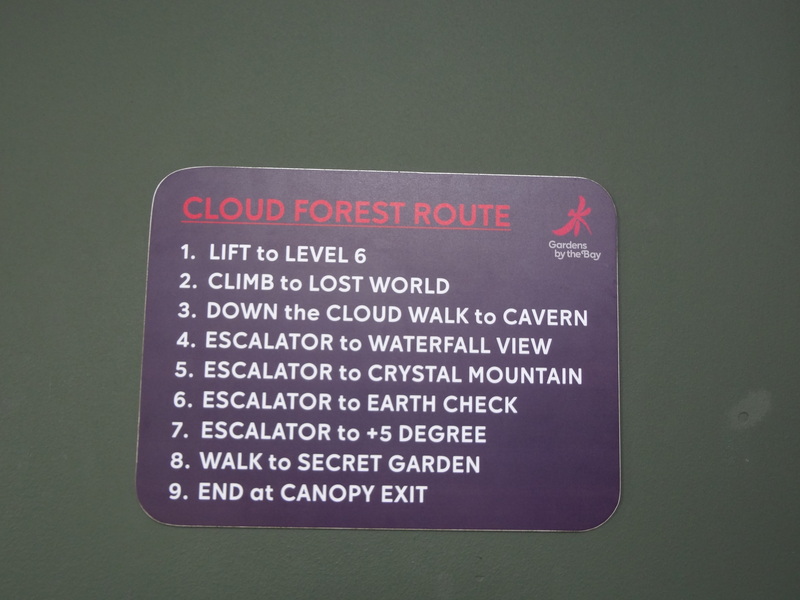 You better follow the suggested steps to enjoy the “Cloud Forest” so you do not miss any interesting features of the garden. 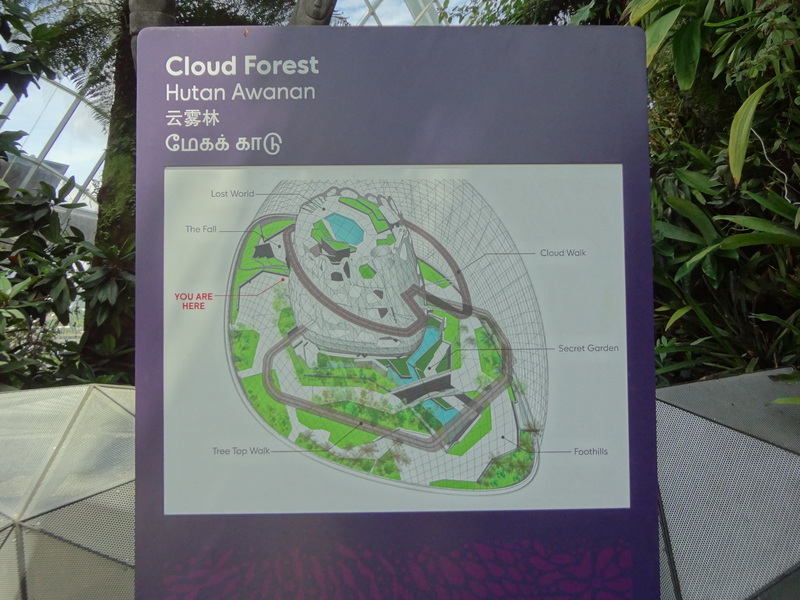 My most memorable experience from the “Cloud Forest” is to pass the “Cloud Walk”. However, if you have fear of heights, you better skip the “Cloud Walk’. 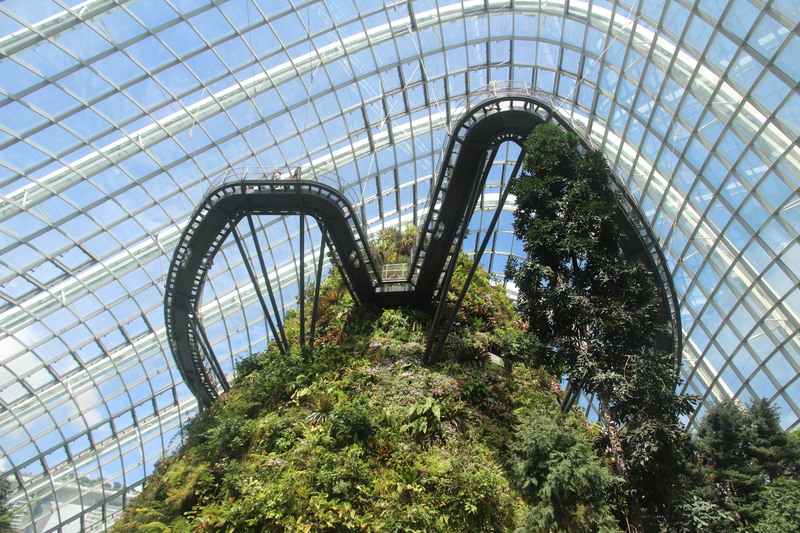 It was lunchtime when we finished exploring the “Cloud Forest”. There are many dining options around the Gardens, from the local delights to the Western food. We chose to have our lunch at “Satay by the Bay’ which is an open foodcourt with the view to the waterfront. Satay is not the only type of food which is offered there. My husband and I ate the satay but Devani had a Turkish cheese bread from one of the stall. After lunch, we returned to the domes area to visit the “Flower Dome”. The main Christmas display was set inside the “Flower Dome”. A lot of visitors took their time to take photos near the display. Devani and I love the succulent garden the most. I tried several times to keep succulent plants alive at home but they did not survive long. Therefore I was amazed with the beauty of the succulent plants collection at the “Flower Dome”. I don’t know the individual name of each type of the succulent plants but they all look amazing! A day in the Gardens is not complete without visiting the souvenir shop. You can find the “mainstream” souvenirs such as t-shirts, caps, key chain, fridge magnet and mugs as well as the unique ones like the “Wabi Kusu” and “Bio Dome”. We missed to see the “Supertrees” at night. The lights and the sound show were scheduled at 7.45 pm and 8.45 pm but we returned to our hotel in the afternoon because we were tired.